So I had this crazy idea a few month's ago to create a "yearbook" of sorts of all the designs we've created over the past year. Then I had an even crazier idea to make a bunch of them to sell. 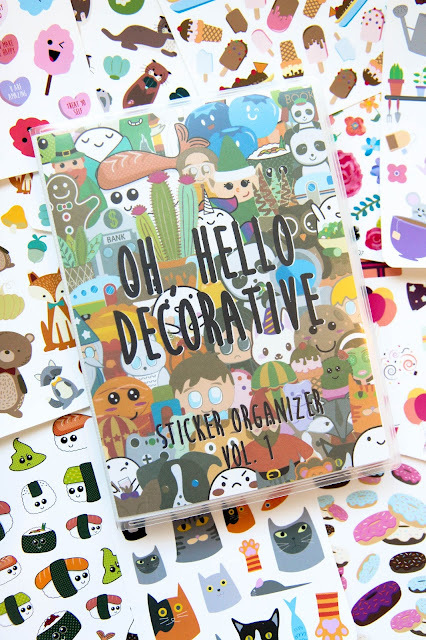 I'm currently knee deep in stickers trying to cut my way out of said crazy idea. It's definitely going to be worth it when they go live this Saturday at 2pm EST at OhHelloCo.com under the featured section on the front page. But until that day, I'll be cutting my life away. I've kept these babies pretty hush, hush for a while so I wanted to finally do a full flip-through and talk about them so when Saturday rolls around people are ready and knowledgeable about what they are and what's in them. It's projects like these that make me realize just how many designs Alex produces. There are 36 different sheets in this book all created by Alex. Plus after I finished the mock-up I remembered quite a few other designs I opted out of including. I think that's what makes Oh, Hello so unique. We design everything ourselves, in house. Sure it means our stickers take longer to create and we can't pump out popular designs at an alarming rate, but I don't think we'll ever change. It's what started this whole thing and although it can be a setback at times, it's something about us that I love.